Declaring that His work had been completed 100% to His satisfaction and that the results would soon begin to manifest, Meher Baba dropped His body on January 31st, 1969. According to His longstanding instructions, His human form was buried in the Samadhi (Tomb-Shrine) He had had prepared for it in the 1940s, atop Meherabad Hill outside Ahmednagar, India (about two hundred miles northeast of Bombay (Mumbai). Since 1969 pilgrims from around the world visit Meher Baba’s Samadhi for the opportunity to bow down and to imbibe the atmosphere of His Love and Presence there. 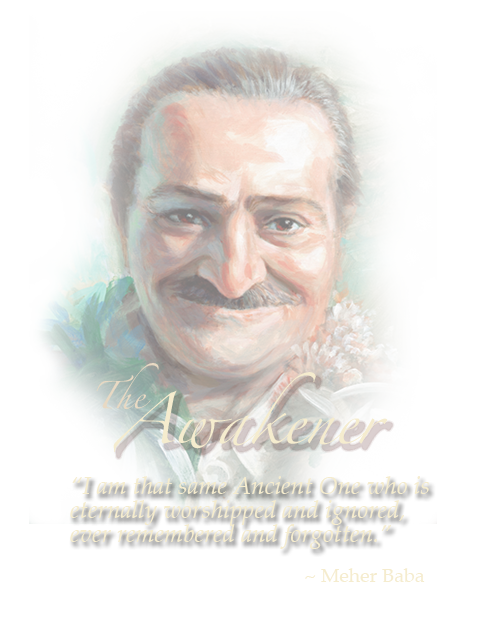 “Following the dropping of My body, I will remain as if physically present for about 100 years, and a little more.” Meher Baba’s passing away ushered in yet another phase in His multi-faceted Advent. With the God-Man’s physical death, external connections with Him are no longer possible—not for another seven hundred years, as Baba often stated, until the Avatar comes again. External connections, however, are not the purpose of the God-Man’s work; they are only the means through which He sets it in motion. He comes on earth as Man to refresh the example of the highest ideals of human life, and to reawaken mankind to the possibility of establishing internal connections with God, the Divine Beloved in every heart. Through the God-Man, God comes to love, and serve, and suffer, for in His unlimited universality, He alone can give to Creation the internal push required to true its course. In His lifetime on earth He sows the seeds of selfless love where they must inevitably blossom and flourish, and He leaves behind His message and His example: in this age, an unparalleled abundance of information about His life stands as profound, compelling testimony to His Reality. Most important, He leaves behind the promise of His eternal presence within and the possibility of drawing ever closer to Him and ultimately realizing Him by remembering Him with love and following the guidelines He has left for all seekers and lovers of God everywhere. © 1987, 2008 The White Horse Publishing Company, Berkeley, California.